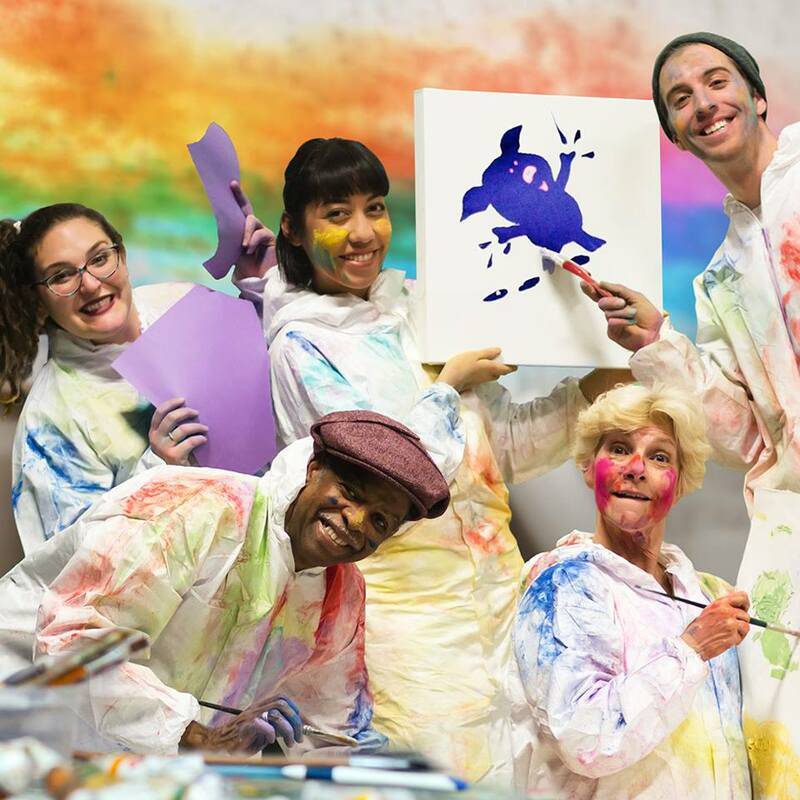 If art is a stuffy, elitist activity that costs a lot of money and produces a lot of sneers, you wouldn’t know it watching Bay Area Children’s Theater’s new musical “Beautiful Oops!” based on the popular children’s book by Barney Saltzberg. In “Oops!” art becomes the product of accidents—a torn page, spilled paint, a disastrous attempt at sculpture, and even the theatrical production, itself. While the book pages you through a series of errors and their resulting artistic boons, the musical adaptation is presented as an error itself—what was supposed to be a rehearsal is actually a show. At first, the actors—playing the various animals from the book—panic, seeing an expectant audience leering at them from the darkness. But then they get creative, driven mostly by the magnetic optimism of Mary Gibboney, who plays Bunny. What unravels is a cacophony of voices, song, dance, audience participation, and, yes, art. The writer, Austin Zumbro, has composed some truly memorable songs. 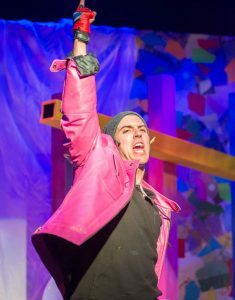 “Pig in a Car” is a standout, partly due to the music, but also due to the lively and hilarious performance from Andrew Mondello, who dons a pink, faux leather jacket and spends half the show pining over car possession. Andrew Mondello, playing Pig, captivates the kids! And while the music is great, Zumbro’s meta-theatrical premise is even greater—allowing him to insert a kind of dramaturgical education for his young audience. The stage manager, an animated Hanna McPheron, is part of the play, calling lighting cues and noting script issues, right there on stage. By the end, she’s even singing the songs. The actors worry over their lack of a script, their improvisations, and their crumbling set—all continually bringing attention to the making of the show, itself. If this all sounds boring and heavy handed, it isn’t. Zumbro and Director Nina Meehan seamlessly entertain and teach in this show, sending the message that a work doesn’t have to be perfect to be great. Most remarkable is the trope that marks the scene changes. As the lights dim, screens descend from the ceiling. On them are illustrated children talking to the audience. The voices are real—recorded kids relating their experiences and perspectives about art. Their points of view are charming and often funny. One young boy says, “At first I thought art was just ‘eh.” The living screens bring a blend of reality, fiction, music, audience interaction, and spontaneity to a show that is essentially a mashup, but still manages to feel well-structured and paced. 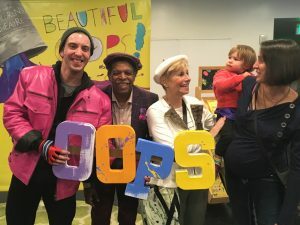 And beyond what kids absorb about storytelling, creativity, art, and the process of creating theater, “Beautiful Oops” is a good reminder to me, a parent, about why we schlep our kids to these things. It probably goes without saying that I would rather go see “Who’s Afraid of Virginia Woolf?” But, in the program, Meehan writes about how we, as adults, can see a child’s mistake as either a “pain point” or a “guiding path.” And if we’re going to be honest with ourselves, all too often it’s a pain point. So, seeing my daughter absorbed by the antics of a talented cast, narrating a cheery message about our small, daily failures, demonstrates that it’s not for nothing. It’s not all just entertainment or art for art’s sake. 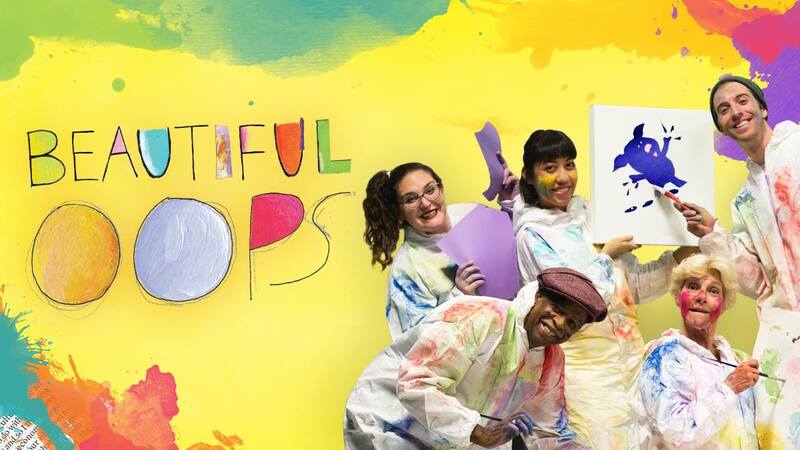 “Beautiful Oops!” reminds us that art is for everyone, by everyone. It’s often hard work, but it can be as simple as a spill, too. It can be planned, an accident, or—as in this case—a planned accident. Just depends on how we all choose to see it. Cast: Mary Gibboney, Kevin B. Johnson, Hanna McPheron, Andrew Mondello, Amanda Nguyen, Brianna Grey Rodriguez, and Anna Smith.